The Fast ForWord Foundations II exercise Paint Match focuses on the following tasks, goals, and skills. Task. Match all the words into pairs using the fewest attempts. The ability to use auditory and visual-spatial working memory to locate matching word pairs in a grid. Paint Match presents words that differ by a single consonant, consonant cluster, or vowel. For example, the words clock and block differ by initial consonant cluster. As the student progresses through the content, the differences occur at the beginning, ending, or middle of the words. At the highest level, Paint Match also presents “alien” words—nonsense words that use basic English spelling patterns—to encourage accurate decoding for unfamiliar words. For details see the content list. Paint Match includes Scientific Learning’s patented speech processing technology. At first, Paint Match presents words in which the speech sounds have been digitally altered using patented methods (including selective intensity increases) to provide enhanced learning opportunities. Initially, the consonant sounds in each word have been enhanced relative to the vowel sound. For example, the word bit is initially presented with acoustically modified versions of the /b/ and /t/ sounds. As the student progresses through the exercise, Paint Match decreases this processing, and eventually presents the words using natural speech. Paint Match displays paint tubes in grids of four, eight, and sixteen. Each paint tube has a word associated with it. The object of Paint Match is to match all the words into pairs in the fewest attempts. To work on Paint Match, the student clicks a paint tube on the screen. The exercise pronounces a word and displays that word on the tube. The student must click the other paint tubes on the screen to find the paint tube with the matching word. If the student clicks a new paint tube that matches one already clicked, the word is pronounced but not displayed. The student must then go back and click the first paint tube of the pair to confirm the match. The two paint tubes disappear. Click counter. The number on the fox’s space suit represents the number of attempts available to match all of the paint tubes in the grid. Each time the student clicks a paint tube, this number is reduced by one, and one of the tokens on the paint palette disappears. 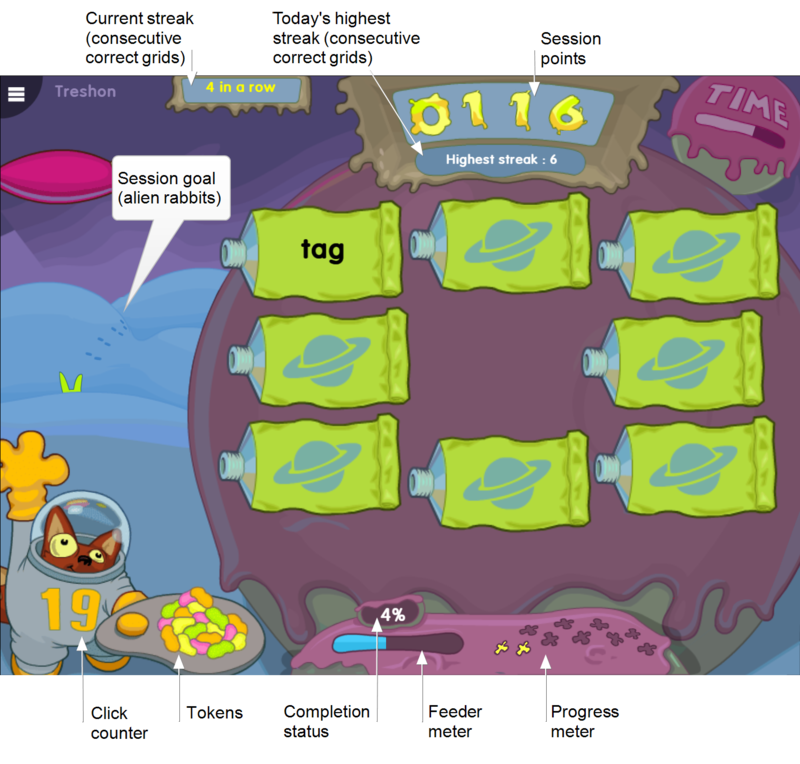 When the student matches all of the paint tubes on the screen within the allowed number of attempts, the exercise awards the remaining tokens as bonus points. If the counter reaches zero before the student has made all the matches, the grid closes and the student starts over with a new grid. To work on the Fluency Round, the student clicks the Go button to hear a target word pronounced. Words appear on the picture frames in the top row, one at a time, from left to right. When the target word appears on a picture frame, the student must click the target word. The student should respond as quickly as possible, without making mistakes, to earn the most points. 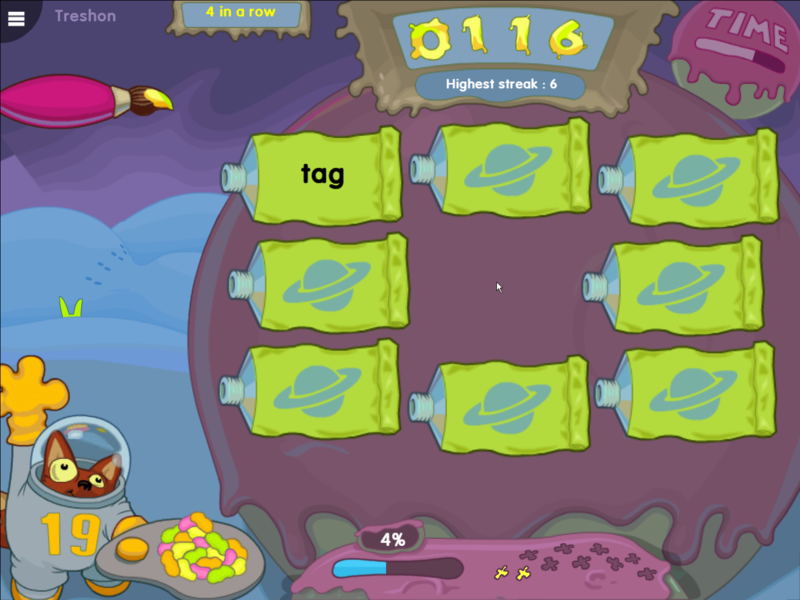 When the student finds all the target words on the Fluency Round screen correctly, the student earns tokens, which appear as lights above the picture frames. The paintbrush token indicates the highest token ever earned. If an incorrect word is painted, or a target word is missed, all tokens are lost and the Fluency Round starts over. At the end of the Fluency Round, any remaining tokens are awarded as bonus points. When the Fluency Round ends, the student returns to the main exercise. Paint Match tracks student responses during the Fluency Round, but does not use this information to advance the student’s standing in the exercise. Instead, the Fluency Round is an opportunity for the student to review the material at a faster pace and earn extra points. Paint Match starts with an interactive demonstration that introduces the exercise. The introduction will not be presented again. In Paint Match, the student progresses through content across three speech processing levels. Each level includes sets of words grouped by different sound changes. In Levels 1-2, the student progresses through the same three groups. In Level 3, the student progresses through all groups, alternating between groups of real words and nonsense words. To advance to the next stage within a set, the student must pass the current stage by making all of the matches within the allowed number of clicks (or touches on a touch-screen device). 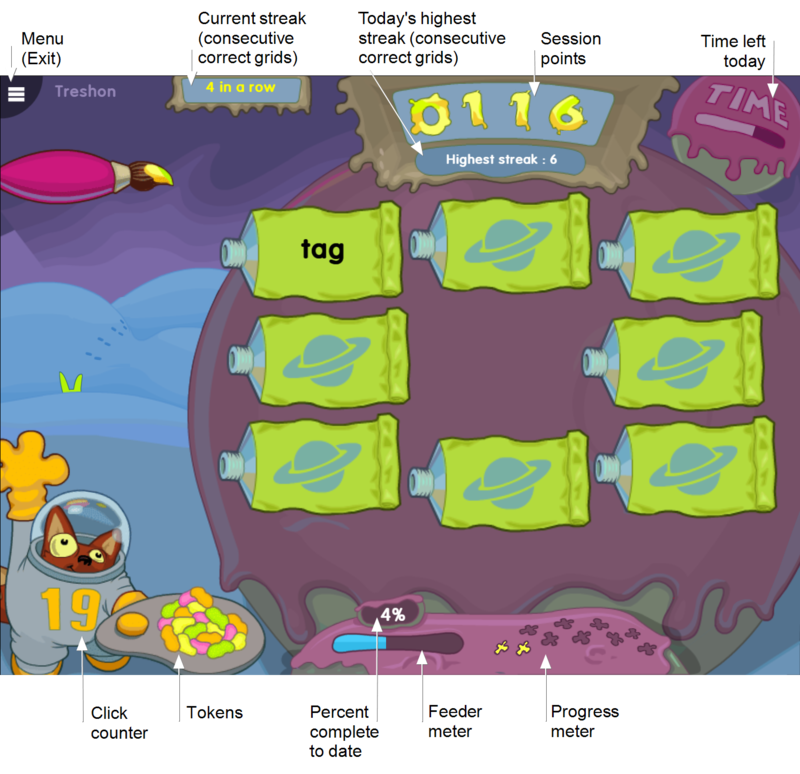 The student can track remaining attempts on the click counter. If the student runs out of clicks before making all of the matches, the student is demoted one stage. To advance to the next set within a level, the student must pass the highest stage. Paint Match adapts to the student’s performance within each set, and will transition the student to the next set if the student repeatedly fails in the early stages. The set will be revisited later in the level. To advance to the next level, the student must pass all sets in the current level. Highest streak. At the start of each new day, the exercise tracks and shows the student’s best “winning streak” of consecutive grids passed. The score appears early in the exercise, and remains on the screen throughout the day. Any time the student surpasses his or her highest streak that day, the sign updates to show the latest number. The highest streak score resets to zero at the start of the next day. Each work session includes a performance goal to help motivate the student. In Paint Match, the student’s goal is to clear more than five grids within the allowed number of attempts per grid. As the student works toward the goal, an alien rabbit leaves tracks in the snow. When the student meets the goal, the rabbit’s ears appear behind the hill. Once earned, these rewards cannot be lost; the rabbit ears will remain visible until the entire product is finished.